OXFORD, Miss. – Like so many University of Mississippi students, Mike Ririe fell in love with Ole Miss during a campus visit. As a high school junior in 2004, the St. Louis native and his dad, Scott Ririe, attended their first Rebel football game preceded by festivities in the Grove and a campus tour. “We never visited another school after that day,” said Scott Ririe, founder and co-president of Control Technology and Solutions, an energy service company based in St. Louis. Mike Ririe graduated from Ole Miss with a bachelor’s degree in business administration and is a commercial real estate agent in Chicago. His brother, James Ririe, of St. Louis, is on track to graduate from the UM School of Business Administration in 2020. The Ririe brothers’ love for their university spread to their parents, who recently made a $300,000 gift to establish the Ririe Family Scholarship Endowment, which will award $6,000 a year for up to eight semesters to two St. Louis freshmen in the School of Business Administration. UM business Dean Ken Cyree thanks the Riries for their generosity. Scott Ririe graduated from Cornell College in 1979 and his wife, Shelley, is a 1981 graduate of the University of Iowa. Yet now, they proudly support Ole Miss. 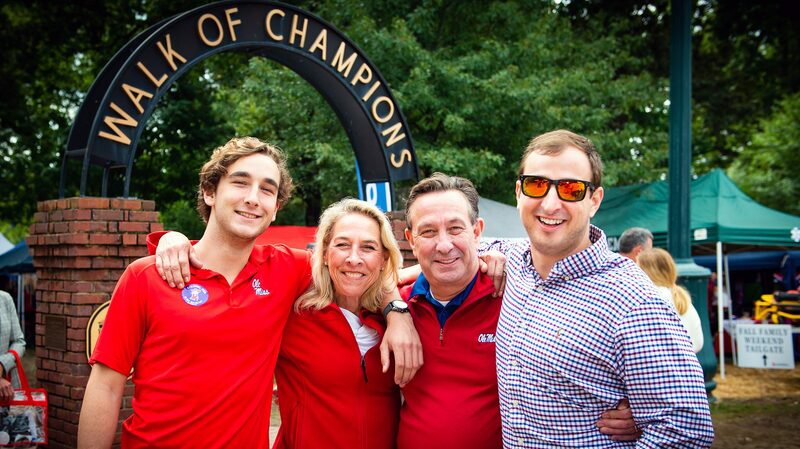 “Our family has become attached to Ole Miss through our boys and their love and loyalty to the university,” Scott Ririe said. The couple also has two other grown children: Andy, a paramedic studying to become a physician’s assistant, and Elise, who graduated from the University of Dayton (Ohio) and is a pharmaceutical sales representative living in Cleveland, Ohio. Scott Ririe began his career working in sales for Honeywell International Inc. in Des Moines, Iowa. He became service sales manager in 1984 and moved to St. Louis, where he was soon promoted again to district general manager. In 2000, he and a business partner founded CTS, which has grown to become the CTS Group, operating in nine states with more than 124 employees and revenue of more than $100 million a year. Scott Ririe serves on the executive committee as treasurer for National Association of Energy Services Companies board of directors and the board of Midwest Easter Seals Association. He also has served on the advisory boards for General Motors and – along with his wife – Ranger Bass Boats. His high school sweetheart and wife of 36 years, Shelley Ririe began her career with Revlon Inc., marketing cosmetics to retailers, before joining Ormco, an orthodontic supplier. She owns Branson West Marine and Powersports, which coincides nicely with the Riries’ favorite activities. To make a gift to the School of Business Administration, visit https://www.umfoundation.com/makeagift/ or contact Tim Noss at 662-915-5932 or tlnoss@olemiss.edu.